2011 Jeep Wrangler changes it’s top. Spy Shots! We love a little bit of covert ops. 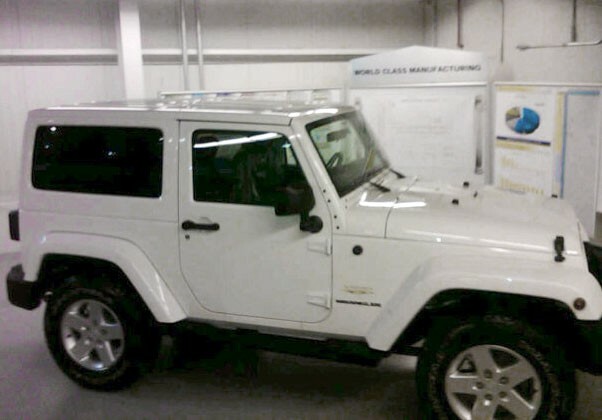 Our Friends from AutoBlog posted this little tidbit about the 2011 Jeep Wrangler. We at Prince Frederick Jeep think this is a long overdue change. Make sure to stop by your favorite Maryland Jeep dealer and check it out! As the most iconic model from a certifiable American institution such as Jeep, it comes as little surprise that every new version of the venerable Wrangler (or CJ if you happen to remember Carter’s presidency) causes pangs of distress from Jeep’s loyal fanbase. Still, from the square headlights of the original Wrangler YJ to the coil springs of the Wrangler TJ and finally – and easily the most egregious of all in our eyes – the loss of the stalwart 4.0 HO inline-six in favor of the 3.8-liter V6 from a minivan in the latest JK, the Wrangler has continued to sell. That doesn’t seem likely to change for 2011, either. From what we can tell from these few spy shots that were snapped at the Jeep factory in Toledo, Ohio, the biggest external change to the next Wrangler is the inclusion of a color-matched hardtop. This is definitely not a bad thing. We can only hope that the next significant alteration to the tried-and-true off-roader-for-the-masses model includes a new drivetrain. Pentastar V6, please, along with automatic and manual transmissions with six forward ratios each. The Mopar division of Chrysler has, in a way, been one of the automaker’s silent heroes. This brand continues to build standard-spec and aftermarket parts for a range of Chrysler products, and while these optional goodies have always been offered in an a-la-carte fashion, Chrysler is now offering a true Mopar version of the 2010 Dodge Challenger. Mopar starts with a Challenger R/T, fitted with the 5.7-liter Hemi V8 and adds a hood-venting system, cold-air intake, front strut brace, unique engine cover and a strut-tower brace. Chrysler hasn’t released official numbers, but we’d say that these modifications are good for an additional 10 or 15 horsepower – nothing crazy. Inside, there’s a Katzkin leather seating package, special gear shifters for either transmission, a custom leather-wrapped steering wheel and – you guessed it – a serialized dash plaque. Only 500 of the Mopar ’10 Challengers will be built, finished in a brilliant black clear coat with a choice of either red, blue or silver accents. (What, no white?) Other exterior changes include things like a black chrome grille surround, black wheels, functional hood vents and hood pins. The Mopar ’10 Challenger hits dealerships next month, priced from $38,000 with the automatic transmission (including the $750 destination charge). Want a do-it-yourself shifter? Add $1,000 to that price. (Wait, what?) For the full details, give us a call at Prince Frederick Dodge. Here is some interesting news we stumbled across this afternoon. Keep your fingers crossed that Prince Frederick Chrysler Jeep Dodge will be one of the dealerships chosen! AUBURN HILLS, Mich., July 6 (UPI) — U.S. automaker Chrysler said it had invited its dealerships to bid on rights to sell the Fiat 500 and that only 125 outlets would be approved. Potentially, 2,300 Chrysler, Dodge, Jeep and Ram truck dealers could bid on the option to sell the small Fiats, which are scheduled to go on sale in the United States in December, the Detroit Free Press reported Tuesday. In addition to a general investment in the brand, Chrysler is requiring dealerships arrange for showroom space that is separate from their Chrysler brand vehicles, company spokesman Ralph Kisiel said. The four-cylinder vehicle is scheduled for construction in Toluca, Mexico, using engines made in Dundee, Mich. The company has said half of the 100,000 Fiat 500s would be sold in the states, while the other half would be targeted for South America.